It’s December, and that means it’s the holiday season in the United States! The holiday season can mean different things to different people and communities across the country. While some Americans prefer to celebrate the winter season in general or nothing at all, December brings several important cultural holidays, including Christmas, Hanukkah, and Kwanzaa. Regardless of what you celebrate this holiday or winter season, we encourage exchange students to explore some of the diverse traditions and celebrations that take place during this festive month. One thing is certain about December in the U.S. – there is no avoiding Christmas. 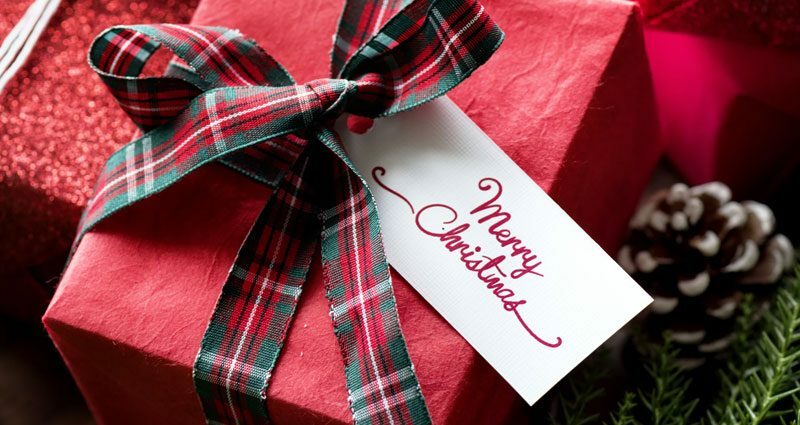 Roughly 90 percent of Americans, whether religious or nonreligious, say that they celebrate Christmas. Needless to say, Christmas itself is an important holiday for American retail stores. Everywhere you look, it seems, there are advertisements and decorations to put you in the gift-buying spirit. It is easy to be overwhelmed by all of the different traditions associated with Christmas in the U.S. The goal of this article is to try to explain at least a small handful of these traditions. Decorating a Christmas tree dates back to the year 1536 when Martin Luther, a religious reformer in Germany, was inspired by the twinkling of stars through the branches of pine trees in the forest. 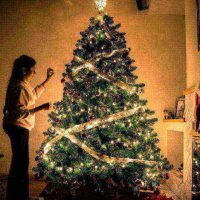 It is a widely held belief that he was the first to set up a tree in his home and decorate it with candles. With the marriage of Queen Victoria to the German Lutheran prince Albert von Saxe-Coburg-Gotha, the tradition was brought to Britain, where it quickly became popular within the upper class. The holiday’s special focus on children and family also began with Victoria and Albert, who had nine little princes and princesses. Upper-class Americans, always attentive to new fashions from Britain, eventually began putting up Christmas trees of their own, and it soon became a central tradition in the U.S. Today, many Americans set up their Christmas trees after Thanksgiving. Many trees are purchased at local Christmas tree lots, which often serve as fundraisers for local Boy Scout troops. 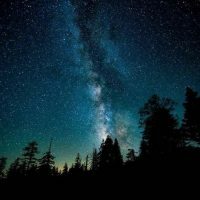 Others take advantage of the vast fir and spruce forests of North America and, for a small fee to the government, cut down their own Christmas trees from approved forest areas. Everyone knows that Santa Claus visits each home on Christmas Eve and delivers gifts to children. But how did this tradition begin? Santa Claus has his origins in a fourth-century Christian bishop named Nicholas, who lived in the Middle East in what is now Turkey. 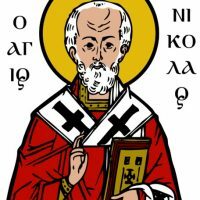 Nicholas was an influential figure in the region. In addition to performing miracles, he earned a reputation for generosity and for saving children from danger. After his death, Christians declared him the patron saint of children and honored him with a special day, December 6, which people celebrated by giving gifts to children. In the Netherlands, where he was known as Sinter Klaas, the story of St. Nicholas merged with local legends of spirits who rewarded good children and punished naughty ones. When Dutch colonists founded the colony of New Amsterdam, which later became New York City, they brought this tradition with them. Santa Claus, as the character became known in English, became especially popular after 1823, when a poem called A Visit from St. Nicholas appeared in a New York newspaper. 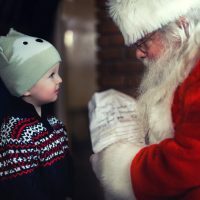 The poem did much to shape the image of Santa Claus that we know today, and it forever linked the story of the gift-giving St. Nicholas with Christmas Eve. 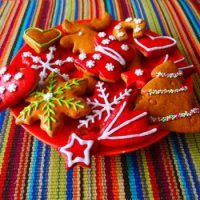 Baking cookies and treats is very popular during this time of year and one of the most popular cookies during Christmas time is the gingerbread cookie. These hard and heavily spiced cookies date all the way back to Medieval Europe. Since the Roman era, people had been importing spices like ginger from the Middle East and Asia, and by the tenth century, it became popular to include ginger in bread recipes. As the spice trade grew, these breads also came to include cinnamon, nutmeg, and cloves. Queen Elizabeth I is credited with being the first to have gingerbread cookies cut in the shape of people she knew and would even have the cookies coated in gold leaf. Soon it became very fashionable to decorate gingerbread men in elaborate designs. Gingerbread houses originated in Germany, where gingerbread is very popular. 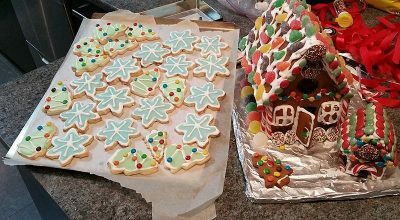 Some historians believe that bakers began creating them to copy the gingerbread house covered in candy from the Grimm’s fairy tale Hansel and Gretel. For some time, these gingerbread houses were just as ornate as the gingerbread cookies and coated in gold leaf decorations. Nowadays, many decorate them in a simple white frosting and adorn them with small candies. Consider baking or decorating gingerbread with your family or sharing your own traditional holiday treats! We hope this article has helped explain at least some of the Christmas traditions you might encounter in the U.S.! If you and your host family celebrate Christmas, we encourage you to share some of your Christmas traditions (and food!) from your home country. No matter if or how you celebrate, the holiday season is about spending quality time with your family and friends and celebrating your accomplishments during the past year. We hope that you enjoy this special season with your host family and new friends you have made in the U.S. and take a moment to pat yourself on the back for all the ways you have grown this past year!